Hanging on to your tools may be critical to your survival. 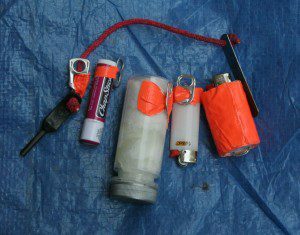 But some small items, such as butane lighters, Chapstick or some survival knives, don’t have a way to attach a lanyard or safety snap. Here’s an easy way to fix that. Prevent loss of small critical survival items by attaching a poptop, and securing them to a clip or lanyard. Take an aluminum poptop and attach it to the small item with a piece of bright tape. Then, whenever you use that piece of gear, clip or attach it to a lanyard. Attach the lanyard to your belt, button hole or zipper fob. Get into this habit and you’ll never drop or lose that critical piece of gear. This is particularly important in areas with a lot of snow, like where I live in Central Oregon. I frequently am out in areas with several feet of accumulation, and dropping a butane lighter in these areas of deep snow virtually guarantees you’ll lose it. Even if you can find the lighter again, chances are the cold will disable it for several minutes. Either of these situations is a problem if you desperately need to build a warming fire and your hands are numb! Avoid potential emergencies caused by losing gear by thinking ahead!